Atticus Finch, played by Gregory Peck in "To Kill A Mockingbird," was named the No. 1 movie hero by the American Film Institute. The tagline for George Clooney’s new legal thriller “Michael Clayton” — “The truth can be adjusted” — is hardly news to anyone familiar with the genre. Allow me to cite precedent. Facher’s response is actually the least cynical, and the most accurate, of the bunch. A court of law isn’t interested in truth so much as facts. It’s not interested in justice so much as closure. It wants dispassion, not passion. Hollywood wants the opposite of each of these things and gets it. That’s the irony of the tagline. Hollywood is forever tut-tutting about the malleability of courtroom truth when — in movies about lawyers — it always adjusts the truth to include the kinds of things so often missing from life: namely, drama and justice. My day job, which certain MSNBC readers are forever telling me not to quit, is editor of eight “Super Lawyers” publications around the country, and I wondered what some of these lawyers thought of the Hollywood version of their profession. But the news ain’t all bad. “What they get right,” says Karen Mathis, immediate past president of the American Bar Association, “is what the legal system looks like, what courtrooms look like, what a lawyer does and what juries do.” To her, this is no small matter. “Any time in an open society that people have access to understanding the legal system — however imperfect that portrayal might be — is a good thing. Do you think they let people in Burma understand their legal system? Along with Newman’s realistic portrait, however, “The Verdict” still gives us a whopper of a fantasy. During the trial, crucial evidence is introduced favorable to Gavin’s case; then it’s ruled inadmissible and the jury is instructed to ignore it. Gavin has no case. So what does he do? During his final summation, he implies that the jury shouldn’t ignore the inadmissible evidence. “Today,” he tells them, “you are the law. Not some book, not some lawyers, not a marble statue or the trappings of the court.” And he wins. 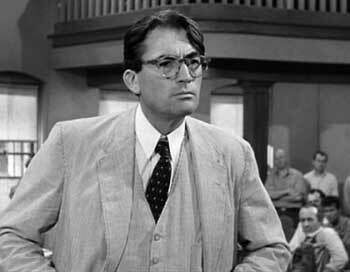 If I had a dollar for every time I heard someone say he or she became a lawyer because of Atticus Finch (Gregory Peck) in “To Kill a Mockingbird,” I’d have enough for a good dinner. Or a bad lawyer. There are other classic movie lawyers, of course. Spencer Tracy was all benevolent wisdom in both “Adam’s Rib” and “Inherit the Wind” (not to mention as Judge Haywood in “Judgment at Nuremberg”), while Charles Laughton, tossing back surreptitious drinks and bellowing “Objection!” to the prosecution’s use of the term “murderer” (it implied gender), shined in “Witness for the Prosecution.” And who wouldn’t want simple, upper-peninsula lawyer Jimmy Stewart to defend them in “Anatomy of a Murder”? But Atticus stands like a calm, dignified titan over them all. A few years ago, the American Film Institute compiled a list of the greatest heroes and villains in movie history, and Atticus was ranked the No. 1 hero. Think about that for a moment. In our most popular story-telling form over the last 100 years, our greatest hero is ... a lawyer. Ah, but was he a good lawyer? Jon March, an Employment Litigation attorney in Michigan, also acts at the Grand Rapids Civic Theater, and in 2005 he got to play Atticus Finch on stage. The role affected him greatly. “I have to say, though,” he mentioned in the 2006 issue of “Michigan Super Lawyers” magazine, “that Atticus was not much of a cross-examiner. He asked a lot of open-ended questions. And Mayella Ewell handed his lunch to him on a plate when he thinks he’s going to get her to admit what really happened. She delivers this powerful speech that begins, ‘All you fine gentlemen with your fancy airs...’ Atticus had to stand there and take it. His question violated all the rules of cross-examination. “But Atticus had other redeeming features,” March added. Indeed. You probably couldn’t even create an Atticus today. The novel came out in 1960 and the movie in 1962 — a time when lawyers were viewed with greater respect. Think of the cinematic lawyers since then. You have alcoholics (“The Verdict”), egotists (“Primal Fear”) and opportunists (“A Civil Action”). You have a slick negotiator wary of the courtroom (“A Few Good Men”). You have a fumbling kid out of law school who can’t argue his case effectively (“The Rainmaker”). You have a frazzled lawyer who gives up his own client during opening statements (“…And Justice for All”). And you have Joe Pesci (“My Cousin Vinny”). And now you have a morally compromised, embattled “fixer” with a gambling problem (“Michael Clayton”). And these are the heroes, people. I haven’t even mentioned the lawyers they go up against — the superefficient corporate attorneys played with relish by the likes of James Mason and Robert Duvall and Jon Voigt, or the true scumbags, like Sean Penn’s David Kleinfeld in “Carlito’s Way”: lawyers, you know, willing to commit murder. Yet despite this change in our cultural perception of lawyers, the basic storyline for these movies remains exactly as it was 70 years ago in “Young Mr. Lincoln” and 45 years ago in “To Kill a Mockingbird”: A lawyer defends the innocent against powerful bastards. That’s pretty much all there is to it. The main difference is that back then the lawyer-hero came sanctified and fully formed. In more modern interpretations, the lawyer has to overcome something (alcoholism, opportunism, a legendary father) to awaken his inner Atticus. After that, the movie pretty much plays out like before. In modern courtroom dramas, in other words, the person we’re most interested in finding innocent isn’t the defendant; it’s the lawyer.